This page is written by the game's inventor, Jean-Louis Cazaux. This Chess Variant is inspired by Timur's or Tamerlane's Chess . It is intended to replace the earlier version of Tamerlane II, which competed in the Large Chess Variant Contest in 1999, with a modest result. Then, several changes have been implemented in an attempt to improve this modern large chess. The board has 11 x 11 squares. The 11 files respect the original configuration of Tamerlane's chess with a central king. The 11 ranks give more space to the game allowing to arrange the piece before struggling. Moreover, they place Bishops and Camels on same colors allowing attack of opposite counterparts and mutual protection. There are 28 pieces per side: 1 King, 2 Princes, 2 Ships, 2 Bishops, 2 Knights, 2 Elephants, 2 Camels, 2 Cannons and 11 Pawns. King, Bishop, Knight and Pawn are orthodox. Prince: moves one square in any direction, like a King. Camel: jumps to the opposite case of a 2x4 rectangle. No matter what intermediate cases contain. The Camel are taken from Tamerlane's Chess. Elephant: moves 1 or 2 cases diagonally. It can jump over the first case if it is occupied. Cannon: moves like a Rook. Takes as in Xiang-Qi: needs an intermediate piece between itself and its victim. The Cannon jumps the intermediate and take the victim on its square. The intermediate is left unaffected. Ship: move one square diagonally and then, goes away of an indefinite number of cases vertically, never horizontally. It can move one square diagonally only. It can not jump and must begin its move with the diagonal step. The Ship is more limited than the Gryphon from Grande Ajedrez which can move horizontally. Nevertheless its move power is comparable to the Rook and the Bishop. The Ship is inspired by the Giraffe from Tamerlane's chess and the Gryphon from "Grande Acedrex". There is no Queen at the start of the game. This piece may appear later on by promotion. King's Succession: a King in checkmate is lost but this does not constitute the end of the game if its player still has one Prince and that this man is not itself in check. In such a case, King and Prince exchange their positions. This counts as one turn. The checking player is free to take or not the new Prince. This process can be repeated as long as the above conditions are fulfilled. They are a second and a third chance as in Tamerlane's chess. Prise en passant: follows the orthodox rules. Castling: there is no castling at Tamerlane 2000. Pawn's Promotion: the Pawn is promoted to a Queen when reaching the last row. Prince's Promotion: a Prince reaching the first opposite row (the 9th rank for White) can be promoted to a Queen. Ship's Promotion: a Ship reaching one of both opposite corners (a11 or k11 for White) can be promoted to a Gryphon. Gryphon : is move one square diagonally and then, goes away of an indefinite number of cases vertically or horizontally. It can move one square diagonally only. It can not jump and must begin its move with the diagonal step. This piece is almost as powerful than the Queen. Victory is obtained when the opposite King is checkmated with no possibility to be replaced. All other types of endgame (pat, perpetual check,...) are classic. 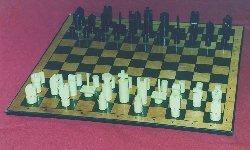 The fact that strong pieces can only appear after promotion gives an original taste to this large Chess Variant. However, for those looking for strategies around "bloody" battles, it could be interesting to try a simple variant where Princes and Ship are replaced by Queens and Gryphons from the initial set-up. You can play either Tamerlane 2000 or Wild Tamerlane with the following zrf file designed by Jean-Louis Cazaux. (providing you own Zillions-of-games software.). However, the Prince crowning is not implemented for programming reasons. Shako and Perfect 12 are two other related game of my invention. Perfect 12 is probably my preferred however. 1) Pawn can promote to Queen on last row. This gives more power to the Pawn. The rule of promoting to any captured piece is unfair since it is a penalty for the strong player who still has many pieces on the board. Promotion to Queen only is an appreciated simplification in this game where there are a lot of different piece types. 2) Princes replace Fers and Wazir. It is a good simplification with1 piece instead of 2 different. Also, the Prince is much more interesting than the Fers and the Wazir which are very limited and weak pieces. 3) Princes promote to Queen on 1st opposite rank. The reason is to make this more likely to happen: the Prince is starting one rank behind the Pawn and can not benefit from a double step. Then, going to the last row would have been a too long trip. 4) Ships can promote to Gryphon on opposite board corners. This gives an interesting possibility with these pieces which are very powerful longitudinally but are rather slow to move laterally. Once promoted, the Gryphon is a dreadful piece which can terminate the game very quickly. 5) Castling is suppressed. It was very rare anyway since there are 4 pieces to remove between the King and the Rook. 6) Non-capturing shift of Bishop, Camel and Elephant is suppressed. It was an unnecessary complication which made the game very unusual and difficult to master. Now, the player has just to remember that dark squares are controlled by the Bishops and light squares by the Camels and the Elephants. Below, you find a photo made by Jean-Luc Muraro of the set of this game, designed and made by Jean-Louis Cazaux. If you click on the picture, you can see it in large size. If you're into quirky variants, you'll love this one. Just get a load of the ship piece type, for instance. There's a problem with the King swapping move. It just gets rid of the Prince instead of switching with it. This variant was a submission for the large-variant contest. It is the subject of this weeks interactive diagram. This variant has some funny rules that required special attention. One was promotion: not only Pawns promote, but a Prince reaching last rank can optionally promote to Queen to. And a Ship can promote to Griffon in the back-rank corners. This was handled by defining Prince as first piece, and specifying only one promoting piece, with as only choices Prince and Queen. This invokes the normal promotion procedure for Princes, letting the user select from the legend table. Another unusual feature of this variant is that, when checkmated, Kings can swapped with Princes,wherever these are located. To make the diagram indicate this possibility, the King was equipped with a universal-leaper move U. The modality 'x', which was already introduced on non-final legs of multi-leg moves to indicate relaying of powers, is now used for indicating such a piece swap with a friendly piece on final (or only) legs. As you have Queens as promotees but not in the array, another possibility could be a win by marriage, as in Doug Chatham's Bachelor Chess and my own Bachelor Kamil.